20131123 - J&I up to the chill of a beautiful frost covered morning. We had a biscuit and sausage gravy bfast with the Old Crow patrol and then helped the boy's patrols get ready for there Webelos Day. Soon about 30 younger Webelos Scouts (including J) showed up to spend the morning with the Boy Scouts to learn how a Troop works and go through some stations to learn some skills. 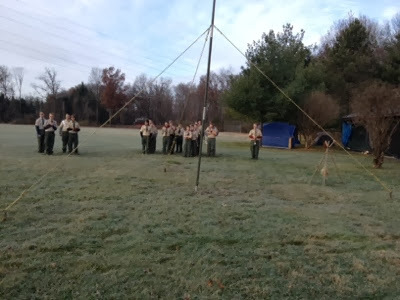 The Scouts started with a very professional and impressive flag ceremony. J started out wanting to go home, but soon turned that into 'I'm not cold, I want to stay!'. So we stayed and he had a great time. 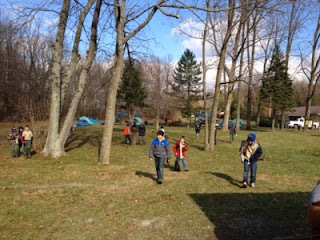 Home after a great camp cooked chili and cornbread lunch. J&I got cleaned up and finished up pamphlets and got things together we needed to take to dinner. L&G home from shopping and we all sat down to watch some OSU Football. Back out in the cold, bundled up for a Scout Thanksgiving dinner. The food was great, the presentation was not too long and we didn't freeze to death. It is really nice to see all the families there together, there were over 100 people there. The rest of us home and turned on the fireplace and relaxed while watching college football. To bed in good time.